A walk though Tokyo ends up an experience of the Japanese take on life and death. I was initially just looking for a shortcut. I am a few meters down the little alley that I see what appears to be a small temple, and decide to check it out. The temple itself is not that interesting, as its architecture is so similar to all its Chinese and Korean counterparts I have seen throughout my time in Asia, so my eyes are attracted by a row of small Buddha statues nearby that a man with a professional-looking camera is busy photographing. We exchange nods, then he steps aside, non-verbally allowing me to pass him and check out what is on the other side of a small palisade. Before I know it, I am surrounded by a myriad of stone monuments, a few flowers, perfectly-trimmed bushes, and the very faint scent of incense. 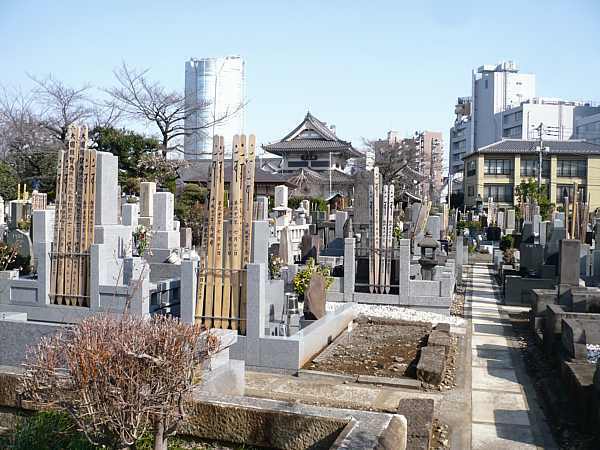 So this is what a Japanese cemetery looks like? It took me a few seconds to really let it sink in, as it is so different than any other cemeteries I have ever been to, not that I have been to that many, mind you. 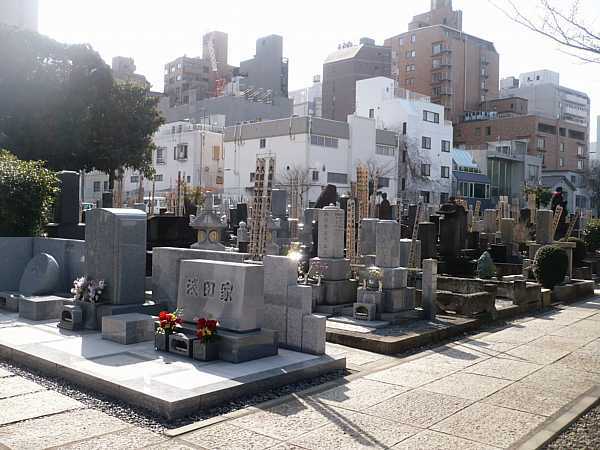 As can be expected in Japan, the whole place is pretty cramped, and there is not much space between the memorials, all somewhat similar but not two of them identical one to another. Some are taller than I am, some short and bulky, some are just cubic-shaped, some a bunch of rectangles piled in different ways, while others are just one plate. 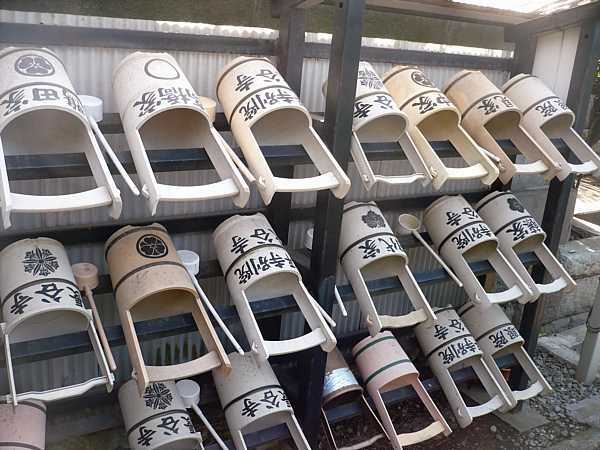 The deceased are cremated, as it is the custom in Japan, and the ashes are put in a small sealed chamber at the bottom. A small vase for incense, a small vase for water, and a small vase for flowers complete that display. Some of them also have pieces of food and glasses of whatever drink on a flat part of the stone pillar, as offerings for the dead to munch on. 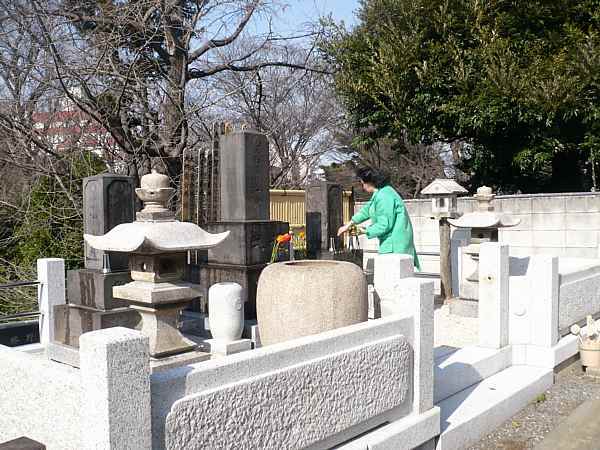 The names are engraved in elegant kanji, some tombs having several, for the whole family. As I am slowly walking through the maze of monuments, I can’t help but feel an immense quietude. The whole place is immaculately clean, the air crisp, the vegetation all around, and everywhere I look my eye is attracted by something I have never seen before. The very fact that I stumbled upon this place by pure chance and randomness adds to the feeling of fulfillment. I am riding one of those travel highs, and want to maximize it. A party of three, one old man, one middle-aged woman and a girl about my age pass me by at a brisk pace, carrying flowers and a small bucket of water. Half-expecting frowns in return, being an obvious intruder in their mourning place and what not, I give them a solemn nod, they reply with smiles and discreet yet welcoming waves. Their attitude makes me think that while dying is indeed tragic, death itself isn’t. It’s just a part of life. The end of the cycle. The state in which we will all be one day. Whoever they come to visit here (friend? sister? husband? ), they do it because of fond memories of that person’s life, not just to cry over his/her passing away. I stay at a respectful distance and watch a woman proceed for a few minutes. Using a long wooden spoon, she splashes water from a bucket on the tomb, then sets the flowers, some in the vase, some in a horizontal position around it. Her movements are without any hesitation, yet not mechanical. She probably has done it many times before. At some point, she turns around to fill her little bucket, makes eye contact, sustains it, and I take it as my cue to keep moving. I keep walking around that labyrinth, hitting dead ends, backtracking, exploring more sectors of that very unique place before going back to the somewhat bland streets of Tokyo. Sure, I will see some other things of interest throughout the day, but for some reason this cemetery visit is one of the very highlights of my visit to the Japanese capital. Felix likes extreme music, cooking spicy food, riding bicycles, drawing comics and going to weird places. He is currently on a never-ending quest to find the best 麻婆豆腐 in all of China. Felix Gervais has written 11 posts on Vagabond Journey. Contact the author. Thanks. I also had a wonderful experience in a local cemetary, in a rural area of Oaxaca. So very different from American cemetaries, this one was ramshackle, with the carved tombs falling over and almost tumbling down the steep hillside. There were wildflowers everywhere. An old man and his wife were there tending the tomb of a relative, cleaning the moss out of the carving and pulling weeds. They had brought a picnic and offered us a glass of water (the day was very hot) which we drank while sitting on neighbor tombs. It was a lovely moment.